Over the past few years we have become widely recognised as one of the leading window shutter specialists in and around London. 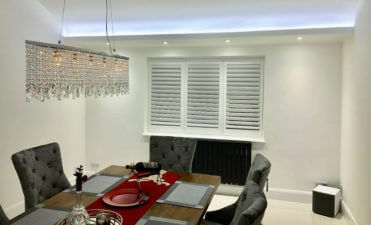 We often carry out work within London for many different clients and types of properties, as well as having a long list of past customers who have had some of our shutters professionally designed and installed within their properties! We can cover all areas of London and have worked on many diverse styles of buildings located in different areas and suburbs of England’s capital. With such a huge range of properties in London every home brings us a new challenge and an excellent opportunity to put our skills to the test. 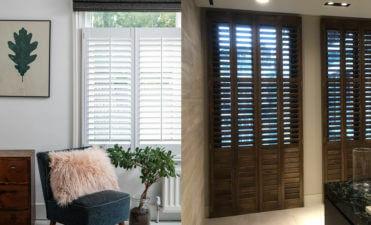 Below we can show you just a handful of client jobs that we have carried out in London: Bespoke Shutters for Penthouse in Edgware Road, London This job was based around a fantastic penthouse apartment in Edgware Road where the client required us to fit shutters to the living room, kitchen, bathroom and bedrooms. We worked with his existing décor and a combination of ideas to come up with the perfect solution which included remote controlled shutters! 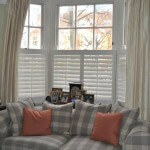 Find out more about this job… Cafe Style Shutters for Home in Chiswick, West London We recently fitted some bespoke café style shutters to a home in Chiswick. 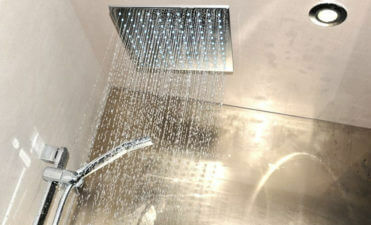 This style is very popular among our clients and works really well with townhouses and homes which overlook busy streets. With this style of shutters we were able to offer the client great privacy when needed, as well as plenty of light from the top section. Find out more about this job… Back Door Shutters for Home in East Dulwich, South London This home in East Dulwich required backdoor shutters for two ground floor rooms with access to the garden. The shutters needed to cover the backdoors and windows while still leaving good access to the patio doors and garden access. 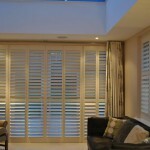 We achieved this with Bi-Fold shutters. 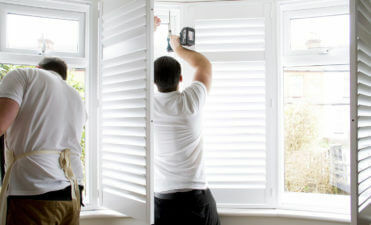 Find out more about this job… We offer our shutter design and fitting service to all homeowners in London and indeed the whole South of England. If you like what you see and wish to have a chat or request a no obligation quote then please do not hastate to contact one of our friendly team. We have worked on such a diverse range of properties that together we can help you come up with the perfect solution for any room of your home!